Spitfire Audio has announced that starting June 9th, their Sacconi Strings libraries will no longer be available on their own. Recently introduced at MusikMesse 2016, Best Service's Chris Hein Solo Violin library is now available. Best Service presents new and upcoming releases at the Messe, including Chris Hein's Solo Violin. Embertone has released Leonid Bass, and offers a bundle deal on the entire Intimate Solo Strings collection for both new customers and previous ones. 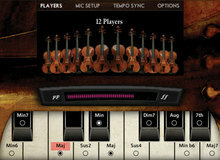 Embertone has released the first audio demo including Leonid Bass, their upcoming double bass Kontakt Library. Spitfire Audio has launched the cello-dedicated second volume of their Sacconi Strings collection live from the NAMM. AudioThing has released Bowed Harp, an aptly-named sound library for Kontakt 5.5.1. Sample Modeling presents The Viola, its new virtual instrument exploiting a further development of the brand's proprietary platform SWAM Engine S.